Review by AllTheBestFights.com: 2018-06-16, good fight between Angel Acosta and Carlos Buitrago: it gets three stars. The Wbo light-Flw champion Angel Acosta entered this fight with a pro record of 17-1-0 (17 KOs=100%) and he is ranked as the No.10 light flyweight in the world (currently the #1 in this division is Ken Shiro). ‘Tito’ Acosta fought three times last year beating Japhet Uutoni and Juan Alejo (Angel Acosta vs Juan Alejo) but between these two bouts he lost to Kosei Tanaka (Tanaka vs Acosta). His opponent, the former interim Wbo champion Carlos Buitrago, has an official boxing record of 30-3-1 (17 knockouts) and he entered as the No.16 minimumweight but he comes off the loss against Hiroto Kyoguchi (Hiroto Kyoguchi vs Carlos Buitrago); before this bout, in 2016, he had beat Noe Medina and Roger Collado but he was also defeated by Knockout CP Freshmart in February (CP Freshmart vs Buitrago 2). 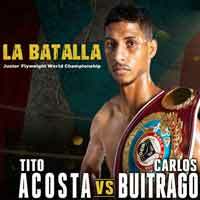 Acosta vs Buitrago is valid for the WBO World light flyweight title (Acosta’s first defense). Watch the video and rate this fight!